Jill Bell accepted the role of volunteer President of Habitat for Humanity of the Middle Keys in 2015, a great task to undertake. Jill spent 4 years prior to her current role as a volunteer and Board Director. In addition to taking on her current position with the responsibilities it holds—Jill is present at all of Habitat's events, represents Habitat to the community, and has stood side be side with other volunteers while we painted our first "A Brush with Kindness" home as well as other hands on projects. Jill Bell spends a large amount of her personal time volunteering with Habitat and being an active President. We have many wonderful volunteers who do a great deal with our organization and we thank you as well. Jill Bell just stepped out in the limelight this year with her constant and vigorous energy and support. Such a wonderful and fun event!!! Thank you Marathon for your support. We raised $6300!!!! Enunciator Attorney David Kirwan who was awarded the Heritage Award for starting Habitat Middle Keys in 1991 and the spelling bee in 1999. 27 families have been served to date by Habitat. Thank you Fishermen's Community Hospital for being our wonderful sponsor for another year of fantastic fun and fundraising. We are so grateful for your partnership. 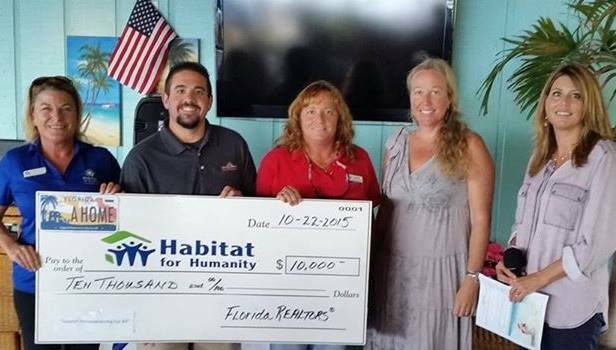 Habitat for Humanity of the Middle Keys received a $10,000 grant from Florida REALTORS®’ "Support Homeownership for All" specialty license plate fund to support the building of four (4) new affordable homes in 2016. 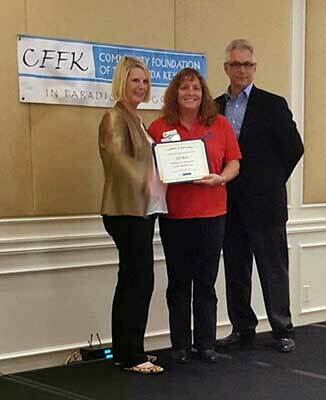 In partnership with the Florida REALTORS® grant, Marathon and Lower Keys Association of REALTORS® (MLKAR) have made the commitment to affordable home ownership by supporting Habitat and to invest its members "sweat equity" volunteer hours in helping with the new build. Executive Director of Habitat Middle Keys, Chris Todd Young received much encouragement and support from MLKAR to help make this wonderful and much needed donation come true. Both Habitat and MLKAR are committed to serving Marathon, working to ensure a strong and dynamic community while addressing the ever increasing need of affordable homes for purchase. To date more than 24,000 "Support Homeownership for All" license plates have been sold, raising approximately $310,000 that has been awarded to affordable housing programs all around the state of Florida. The Florida Realtors specialty license plate is available by mail or at your county tax collector’s office. The license plate costs an additional $25 (beyond the state's fees for a tag). If you purchase the tag online, you’ll pay a convenience fee, which amounts to either $2 or 2.95% of the total cost of the tag. For more information or to purchase online visit www.floridarealtors.org/…/homeownership-for-all-license-pla…. To support Habitat for Humanity of the Middle Keys 2016 build efforts please contact Chris Todd Young, Exec. Director @ 305-743-9828 or email execdirector@habitatmiddlekeys.org. For more information about Habitat visit www.habitatmiddlekeys.org. Pictured at the check presentation from left: Chris Todd Young, Exec Director Habitat; Ryan Elwell, Royal Furniture MLKAR Affiliate Member; Jill Bell, 2015 President Habitat; Sandy Tuttle, American Caribbean Real Estate MLKAR Director; Lisa Ferringo, Coldwell Banker Schmitt Real Estate 2015 MLKAR President. 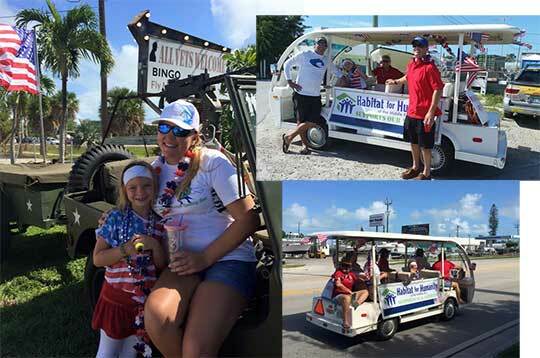 Habitat for Humanity of the Middle Keys Supports Our Veterans during the Annual Veteran's Day Parade. Bank of America steps up to give back to the community they serve with a $2,500 grant to Habitat for Humanity of the Middle Keys. In this critical time of housing in the Middle Keys, Executive Director Chris Todd Young states "This is such a wonderful blessing. It really does take a village and we are so happy Bank of America is part of ours". Habitat Middle Keys will use this donation toward the building of 4 new homes in 2016. For more information about donating to Habitat to help build affordable homes please contact Chris Todd Young at 305-743-9828 and view their website at www.habitatmiddlekeys.org. Matt Bussard, 2015 Board of Director, believes everyone needs to chip in and support Habitat. Habitat for Humanity of the Middle Keys wants to say thank you to the many people that we were able to entertain on Saturday March 28th during our "Habitat Publix" day where the Board of Directors along with volunteers and future home owners took on the challenge of bagging groceries for Publix customers during a very windy and busy shopping day on our beloved island. The goal of the day in addition to community awareness was to raise donation money that will go directly to the building of the next two homes on 64th and 65th Streets. "Affordable home ownership is so very important in Marathon. It is the foundation for families living and working here.... without a safe decent home, our neighbors and colleagues are at risk of having to leave this beautiful community" states Chris Todd Young, Executive Director. With so much appreciation to the patrons we met on Saturday, we raised $1,363 and sold 25 boat raffle tickets. Habitat's fundraising is imperative to their success of building and/or renovating homes for future owners. The next big event is the 9th Annual Mother's Day Dolphin Tournament on May 8th & 9th. In addition to that, they are currently holding a donation raffle for a brand new boat. 2014 was a wonderful and successful year for the Middle Keys Habitat Affiliate. 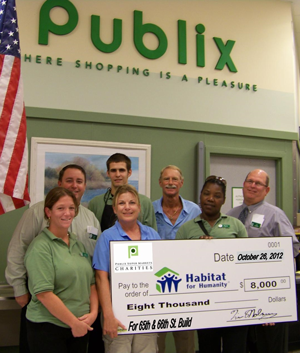 Closing out the year with Publix Super Markets Charities making an outstanding contribution in the amount of $8,000 to the affiliate as support for their mission of creating truly affordable home ownership to hard working, income qualified families in Marathon. The grant will be used to fund a portion of the expense involved in building two new homes, anticipated to be complete by June 2015. The partner families that were selected by Habitat Middle Keys are currently working on their required 500 hours of sweat equity. Habitat has been busy and in addition to the building of two new homes they are currently processing family applications for an additional two homes; making 2015 the year that 4 new hard working families will realize the dream of home ownership. "We are very thankful and appreciative of the support, "said Christine Todd Young, Habitat for Humanity of the Middle Keys' Executive Director. "With affordable housing on the forefront right now, their generosity is truly a blessing and helps make our mission possible and dreams come true for families in Marathon". 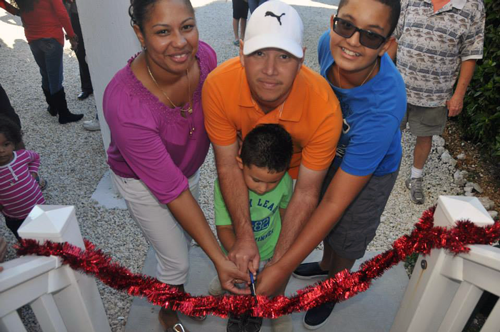 On Dec. 14, 2014 Habitat for Humanity of the Middle Keys dedicated a home to their 22nd partner family. Through the good will and determination of the 2014 Habitat Board of Directors Erick, Yaramy and their two young boys will spend their first ever Christmas in their very own home. Pictured are dad Erick, mom Yaramy and their boys Erick and Jacob who have spent hundreds of sweat equity hours on preparing their new home. "So many people and companies were a part of this blessing.... it means so much to all of us and of course most importantly the family". Affordable home ownership has been on the forefront of many discussions in the past weeks and Habitat Middle Keys remains constant in their effort. "It is a need, more than any other here in Marathon, and Habitat is going to keep pushing forward to do everything we can within our financial means to continue to create affordable home ownership". Lopez Tile, Greentech Group Solutions, Valspar Paint, Florida Keys A/C, Alex Landscaping, Maite Lopez, Marathon Lumber, Publix Super Market Charities, Marathon & Lower Keys Associations of Realtors, Royal Furniture, The City of Marathon, Law Offices of Christopher B. Waldera, Bank of America, Coldwell Banker Schmitt Real Estate Co. and BB&T Bank. By Phone 305-743-9828, By Email execdirector@habitatmiddlekeys.org. Please view our website at www.habitatmiddlekeys.org and our Facebook page with photos at www.facebook.com/hfhofthemiddlekeys. 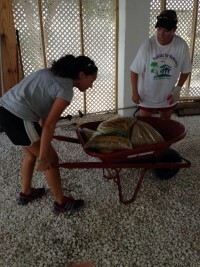 You can make donations via our website www.habitatmiddlekeys.org toward the building of our next two homes in Marathon. Habitat Middle Keys is excited to announce the completion of our Brush with Kindness project. This was truly a wonderful project. Pat Rathbun, her family (sister, brother in law, sons, grandchildren, and more) as well as friends are BEYOND grateful. We created many tears of happiness. A very big thank you to all the local officials, companies and individuals who helped us protect the future of one of our neighbors. Please view the video below to see for yourself the difference we can make. Feel free to share forward so that others may see what we do with the partnerships we have created in Marathon. Bank of America and Habitat for Humanity of the Middle Keys join hands and hearts toward the mission of creating affordable home ownership in Marathon. Tanya Fraser, VP/Banking Center Mgr at Bank of America presented to Habitat's 2014 Board of Directors: Lupe Marzoa, Secretary; Tim Wonderlin, President; Jill Bell, Vice Pres; Chris Todd Young, Exec. Director and Don Dahlfues, Treasurer; a wonderful grant in the amount of $2,500 that will be used in the building two new homes scheduled for an early 2015 completion. These homes, which are sold at cost and with a zero percent interest mortgage, allow hard working families in the Middle Keys to realize the American dream of home ownership. The applicant families, who were selected earlier this year, are currently working on the required 500 hours of sweat equity that must be completed before they purchase the home from Habitat. Habitat is so grateful for the support of Bank of America and working together to build a better community. 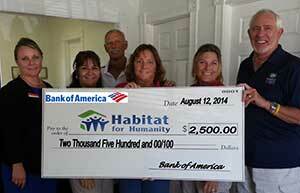 BB & T Bank donated $1000 and selected Habitat Middle Keys as their Lighthouse Project for 2014. 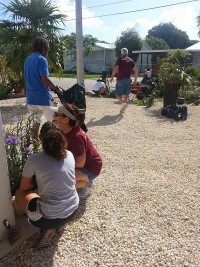 On June 21st a wonderful group of volunteers from BB&T, Habitat and our community converged to a home in Marathon and braved the heat to complete the wonderful landscaping project together. The group was happy to "lend a hand up" and make a difference in Marathon. The home, once the rehab is completed, will be sold at cost and a 0% mortgage to wonderful well deserving and hard working family in Marathon. Habitat's Mission is to create affordable home ownership for hard working families in Marathon. If you would like to become involved in Habitat, contact the Executive Director at 305-743-9828 or execdirector@habitatmiddlekeys.org. Visit www.habitatmiddlekeys.org for more information. 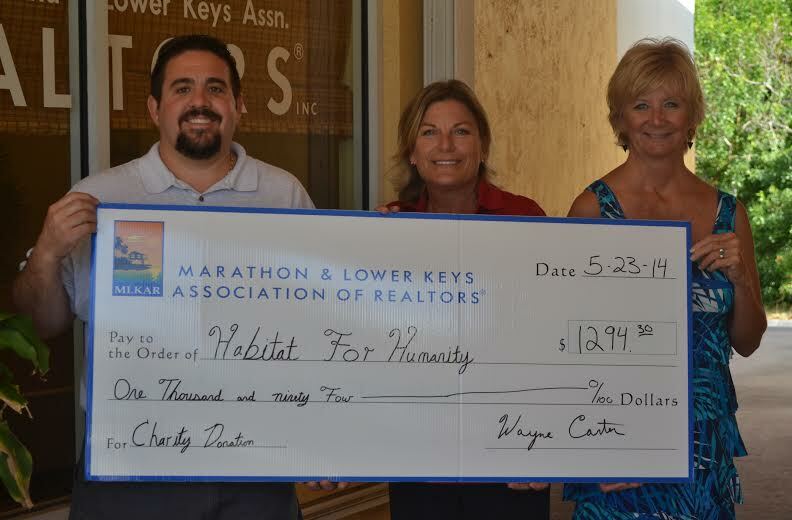 Marathon & Lower Keys Association of Realtors® CHARITY OF THE MONTH for April was Habitat for Humanity, Middle Keys. Ryan Elwell, Royal Furniture, and Stacie Kidwell, American Caribbean Real Estate, presented Habitat for Humanity Executive Director Christine Todd Young (center) a check for $1,294.30. Monies raised include a portion of sales from customers referred to Royal Furniture by local Realtors®, and donations collected by members. 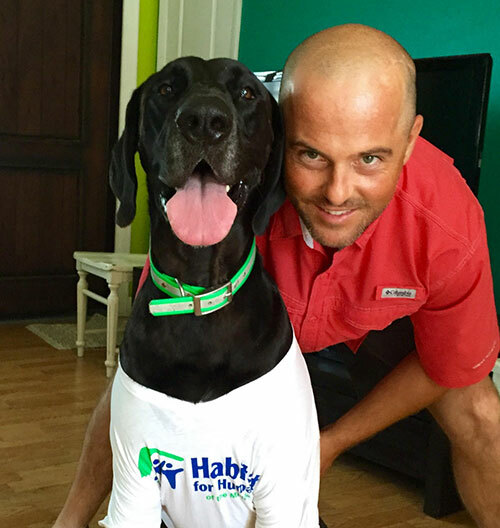 Habitat for Humanity, Lower Keys, is the Charity of the Month for May. The Key Colony Beach Fishing and Boating Club presented a wonderful donation of $500 to Habitat Treasurer Don Dahlfues and Exec Director Christine Todd Young to use toward the 8th Annual Mother's Day Dolphin Tournament. Habitat for Humanity of the Middle Keys has named and elected their 2014 Board of Directors and Officers. 2014 Board of Directors and Officers are: Tim Wonderlin, President; Jill Bell, Vice President; Don Dahlfues, Treasurer; Pam Marco, Secretary; Patrick Stevens, Blair Shiver, Bob Warn, Elba Ornelas, Jess Kaplan, Katia Chacon, Kelly Manghir, Lupe Marzoa, Matt Bussard and Rev. Larry White. This year Habitat Middle Keys will be working on two new home builds, one rehab and completing the first Brush with Kindness project. In order to make these projects a success, Habitat will be holding their 8th Annual Mother’s Day Dolphin Tournament May 9-10th 2014 which includes the 2nd year they will raffle a brand new boat. With much to do, Habitat is always looking for people who wish to donate their time, skills and monetary resources to the organization’s mission: Putting God’s love into action by building homes, communities and hope. The support of corporate grants such as Publix Super Markets Charities and our community, we can build safe, decent and affordable homes and sell them to hard working families who live and work in Marathon – contributing citizens in our wonderful city who deserve the dream of home ownership. For more information about Habitat Middle Keys you may visit habitatmiddlekeys.org or contact the Executive Director, Christine Todd Young at 305-743-9828. Information about the 8th Annual Mother’s Day Dolphin Tournament can be found by visiting mothersdaydolphintournament.com. Board of Directors Blair Shiver and Elba Ornelas kicked off the Marathon Seafood Festival booth for Habitat on March 8th. Only 300 tickets will be sold to win the brand new 2014 15' Edgewater 158CS boat with a Yamaha F70 motor and EZ Loader Trailer. For your ticket please call 305-743-9828 OR stop in and visit Marathon Boat Yard Marine Center ~ Habitat Build Sponsor as well as sponsor of both the boat raffle and the 8th Annual Mother’s Day Dolphin Tournament set for May 9th & 10th this year. WAS THE BEST BEE EVER!!!! 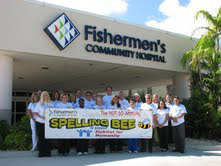 Thanks to our sponsor Fishermen's Community Hospital. We had 13 Teams with our 1st ever "Kid" Team, Marathon Home School Group sponsored by BB & T Bank. With words like termagant, accoucheur, and vexillology this was an amazing Bee where at the 12th Round there were still 3 teams spelling for the win. We had a fantastic Silent Auction with prizes such as A Brand New Recliner, courtesy of Royal Furniture; Stays at Hawks Cay Resort, Snuba trip from Tildens, Limo to Key West from Tropical Limo and so much more!! Overall, this was our most successful Bee in history!! We raised 60% more donations than any prior year. The following for their wonderful donations and contributions: Centennial Bank, San Pablo Church, KeyHopper Taxi, Karen Trujillio,Cash Flow Jewelry, Cristina's Boutique, Florida Keys A/C, Vespa Stained Glass, BB & T Bank, Linda Lee Byars, Keys Weekly Newspapers, Hawks Cay Resort, Glunz Ocean Beach Hotel, Sombrero Country Club, Tarpon Creek Bar & Grill, Tilden's Dive Shop, Dolphin Research Center, Tropical Limo, Royal Furniture, Captains Hook's, and all the wonderful volunteers who took their time out to make a great event. Our wonderful Emcee, Jason Koler. Enunciator extraordinaire: Dr. Hal Leftwich. Our Judge Panel: Sarah Morton, Deb Wonderlin and Katrina Wiatt. And last but not least all of our wonderful homeowners, volunteers and Habitat Board of Directors. Without their time into this event our success would not have been possible. 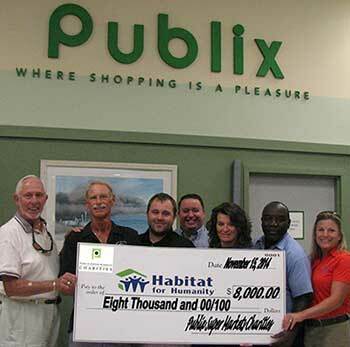 The Publix Super Markets Charities has made an outstanding and wonderful contribution to Habitat for Humanity of the Middle Keys. On December 9th, 2013 a grant in the amount of $8,000 was awarded to the affiliate as support for their mission of creating truly affordable homeownership to hard working, income qualified families in Marathon. The grant will be used toward our next two homes which are proposed for completion in the summer of 2014. 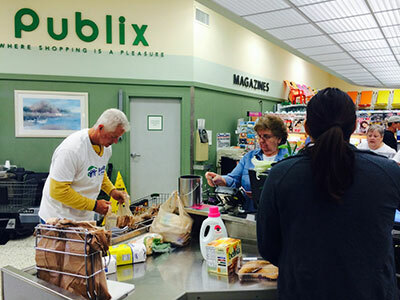 "Publix Super Markets Charities was established by Publix's founder, Mr. George Jenkins, to improve life in our communities. We believe Habitat for Humanity of the Middle Keys exemplifies that mission and we are pleased to play a part in their efforts" states Kelly Williams-Puccio, Executive Director for Publix. "We are very thankful and appreciative of the support we have received from Publix since 2010,"said Christine Todd Young, Habitat for Humanity of the Middle Keys' Executive Director. "Their generosity helps make our mission possible and dreams come true for families in Marathon". OCTOBER 2013 ~ Not for Profit Humanitarian Award. We are so very proud and honored to be the recipient of the 2013 Greater Marathon Chamber of Commerce Not for Profit Humanitarian Award. On behalf of our Board of Directors, volunteers, homeowners and future homeowners—Thank you Marathon Chamber members, friends and colleagues. It means so much to us and we are so proud to be a part of this wonderful community and Chamber!!! The Awards Banquet at Hawks Cay was incredible and what an amazing group of people!! Publix Super Market Charities, Alex Landscaping, Discount Rock and Sand, Rhodes Plumbing, Keys Contracting Services, Inc., Florida Keys Contractors Association, Modular Homes of the Florida Keys, and Building Solutions. With the help of these wonderful companies, Habitat for Humanity of the Middle Keys is able to build safe, decent and affordable homes for hardworking families in Marathon. Volunteers Matt Bussard and Chelsea Broderick are all smiles with 2013 Board of Director Elba Ornelas on Saturday Aug. 26, 2013. 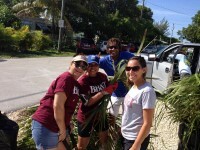 Habitat "gave back" to the Florida Keys Contractor's Association by helping with their Annual Poker Run. This crew manned the Lazy Day South location. 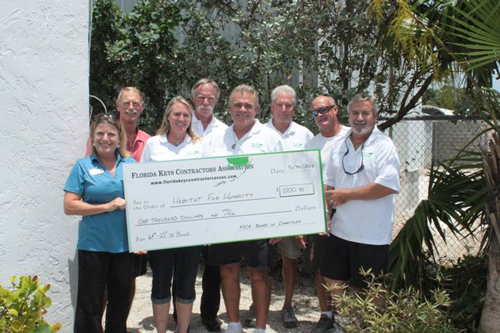 Florida Keys Contractors Assocation presented a check to Habitat in the amount of a $1,000—a wonderful donation towards the 65th/66th Street Build "Homes for Happiness". 2013 Habitat Board President, Tim Wonderlin was on hand with Exec Director Chris Todd Young to accept this donation. The Contractors Association was represented by Christian Weinhofer, Harry Kostic, Chris Gratton, Brooks Thommes, Brian Botsford, and Bruce McClenithan. Habitat Middle Keys Board of Directors are so very thankful for the support. 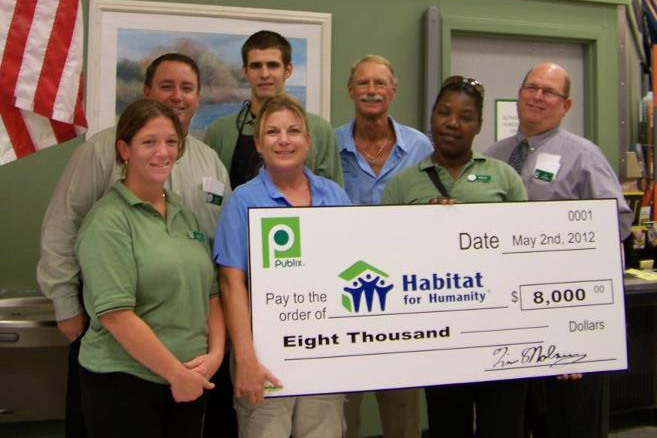 Publix Super Market Charities Grant ~ The Publix Super Markets Charities has made an outstanding contribution to Habitat for Humanity of the Middle Keys. 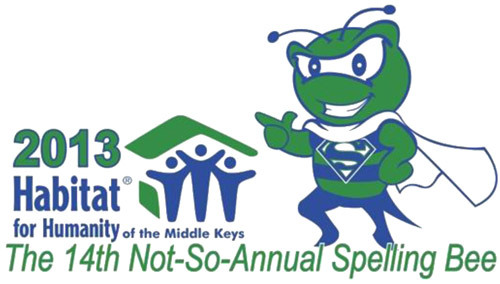 In October 2012 a grant in the amount of $8,000 was awarded to Habitat Middle Keys as support for their mission of creating truly affordable homeownership to hard working, income qualified families in Marathon. The grant will be used to fund a portion of the 65th/66th Street "Homes for Happiness" Build. The partner families that were selected by Habitat Middle Keys are currently working on their required 500 hours of sweat equity. “Publix Super Markets Charities was established by Publix’s founder, Mr. George Jenkins, to improve life in our communities. We believe Habitat for Humanity of the Middle Keys exemplifies that mission and we are pleased to play a part in their efforts” states Kelly Williams-Puccio, Executive Director for Publix. “We are very thankful and appreciative of the support,” said Christine Todd Young, Habitat for Humanity of the Middle Keys’ Executive Director. “Their generosity helps make our mission possible and dreams come true for families in Marathon”. May 2013 ~ CONGRATULATIONS to long time Marathon local, Bill Heffernan. Mr. Heffernan, "Lucky Bill", was the winner of our 1st time boat raffle which was made possible by our wonderful partners Marathon Boat Yard with Yamaha and Edgewater. 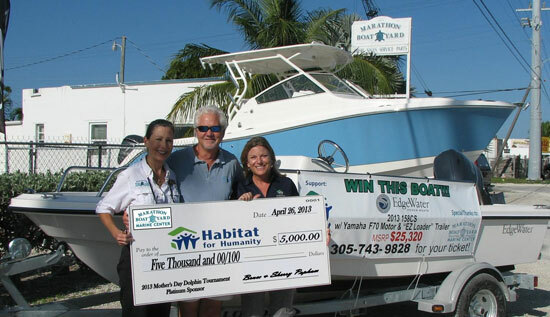 Bill supported Habitat Middle Keys with a $100 donation for his "winning ticket" that was pulled from a total of 300. 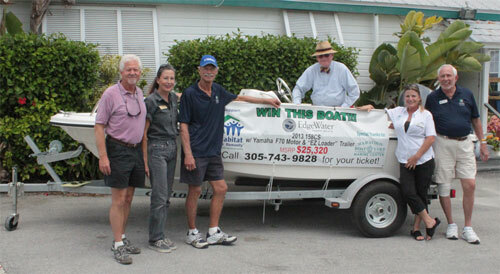 Pictured (from the bow) are Marathon Boat Yard owners, Bruce & Sherry Popham; Tim Wonderlin, 2013 Habitat President; Bill Heffernan (seated); Christine Todd Young, Habitat Exec. Director; and Don Dahlfues, 2013 Habitat Treasurer. 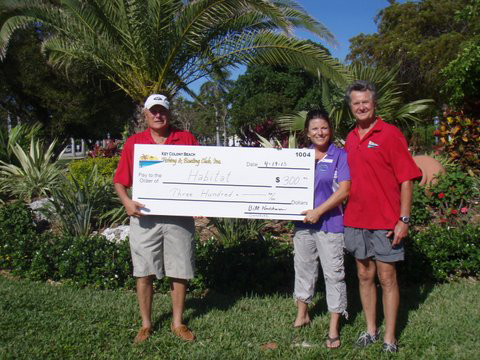 Key Colony Beach Fishing & Boating Club graciously awarded Habitat for Humanity of the Middle Keys a donation in the amount of $300 towards the 7th Annual Mother's Day Dolphin Tournament. Commodore Bill Knickman with next in command, Bob Warn (who is also a 2013 Habitat Board of Director) presented the "big check" to Chris Todd Young, Habitat ED. 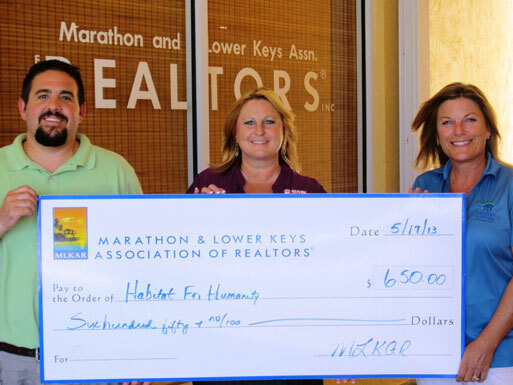 Marathon Lower Keys Association of Realtors selected Habitat Middle Keys as their focus for April 2013. Christine Todd Young (right), Executive Director for Habitat Middle Keys accepted a check for $650.00 presented by Ryan Elwell, Royal Furniture and Julie Anne Salz, RE/MAX Marathon Vacation Real Estate. Money raised and donated to Habitat included a portion of sales from customer referrals to Royal Furniture by local Realtors and contributions collected by MLKAR membership. The Marathon Boat Yard Marine Center along with Yamaha, has partnered with Habitat Middle Keys this year as the main sponsor of the 7th Annual Mother's Day Dolphin Tournament. A wonderful addition to this year's tournament; the raffle of a brand new 2013 Edgewater 158CS Power Boat with Yamaha F70 motor and "EZ Loader" trailer was the product of owner's Bruce and Sherry Popham's mind. They wanted to assist in this being the best tournament to date. 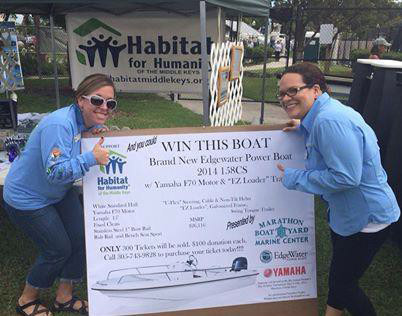 The raffle tickets for the boat are on sale now for a donation to Habitat in the amount of $100.00. Only 300 tickets will be sold. For a ticket, you can stop into Marathon Boat Yard at 2059 Overseas Hwy, Marathon or contact Habitat Executive Director at 305-743-9828. The drawing for the brand new boat, valued at $25,000, will be on May 11th, at the tournament. The 7th Annual Mother's Day Dolphin Tournament to benefit Habitat Middle Keys will be held on May 10th – 11th. This is a fun and festive one day fishing tournament with over $15,000 in cash and prized to be awarded. Information about the tournament can be found at www.mothersdaydolphintournament.com or by calling 305-743-9828. Marathon Boat Yard is the Florida Keys' One Stop Boating Center, serving Ocean Reef to Key West. It is the largest full service marine facility in the Keys. Habitat's Exec Director Christine Todd Young said "We are so thankful for their partnership and that they have embraced our organization. Their efforts will positively affect our ability to "give a hand up" to those who need it." 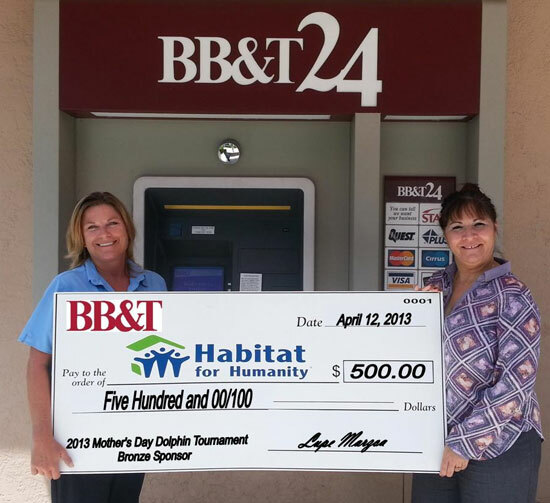 BB & T Bank supports Habitat Middle Keys with a wonderful donation of $500.00. This Bronze Sponsorship level for the 7th Annual Mother's Day Dolphin Tournament is so greatly appreciated. The tournament will be held on May 10-11th. It is the largest fundraiser of the year for the organization. Pictured: Habitat Middle Keys Executive Director, Christine Todd Young with Lupe Marzoa, Asst. Vice President/Financial Center Leader II. Lupe is also a 2013 Board of Director with Habitat Middle Keys. We thank her so much for her time and dedication to our organization and mission. 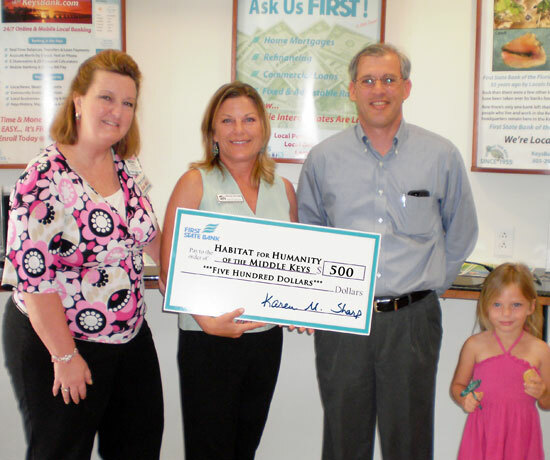 First State Bank supports Habitat Middle Keys with a wonderful donation of $500.00. This Bronze Sponsorship level for the 7th Annual Mother's Day Dolphin Tournament is so greatly appreciated. The tournament will be held on May 10-11th. It is the largest fundraiser of the year for the organization. Pictured: Becky Shifflett, CSO/Branch Manager; Jeff Smith, Sr. Vice President/Senior Lender; and Habitat Middle Keys Executive Director, Christine Todd Young with Caidyn Young (4) as a executive in training. 2013 President Tim Wonderlin and Executive Director Christine Todd Young were all smiles at the 2013 Marathon Seafood Festival. This wonderful booth was a great time to educate people on our organizations mission and to begin selling tickets for our 2013 Boat Raffle. Habitat Middle Keys joins St. Paul AME Church to celebrate Martin Luther King, Jr. "A Day On, Not A Day Off"
Friday September 21st 2012, a spelling team sponsored by Island Service claimed victory at the 13th (not-so) Annual Spelling Bee benefiting Habitat for Humanity of the Middle Keys. To capture the crown, Sara Matthis, Anne Romance and Michelle Franck bested a collegiate dictionary and an assemblage of wordy maestros including a fishing guide, some realtors, small business owners, and a slew of bankers and health care professionals and took the title (and Bee trophy) with "scena". 2nd place was team "(Glamerous) Dead Woman Walking" sponsored by the Monroe County Medical Examiners Office and taking 3rd would be last years reigning champs, team "Spelling Words of Wisdom, Let it BEE!" the 2 Switlik 1 MHS spellers sponsored by First State Bank. Best team name went to FKEC's sponsored team "The Dim Watts" and Best costume was had by team "G.I. Jones" sponsored by Sarah Cizmas, Edward Jones. Thank you so very much to our partner sponsor Fishermen's Community Hospital and all of our teams and their sponsors: Edward Jones (Sarah Cizmas), Centennial Bank, Coldwell Banker, Island Service, First State Bank, MC Medical Examiner's office, FKEC and Iberia Bank. Together we raised $2,600 to continue our mission changing lives of hard working families in Marathon and making affordable home ownership a reality vs. just a dream. Special thanks to the following for helping make this happen: San Pablo Catholic Church, Judges Panel of Chris Fletcher (FKCC), Jeff Coldren (Board Fishermen's) Marathon Mayor Pete Worthington; our enunciator Dr. Hal Leftwich, CEO Fishermen's, our emcee Jason Koler (the Keys Weekly Newspapers), the Habitat volunteers, the Capital Bank volunteers, Byars Music Store, Centennial Bank, Circle K, The Elks Lodge, Home Depot, Casa Marina KW, Little Palm Island, Spirit Catamaran, Brandi Simpson LMT, Keys Grafix, Walgreens, Kmart, Roco's Dockside and Sundance Watersports Hawks Cay. We could not do what we do without your support. THANK YOU!!! 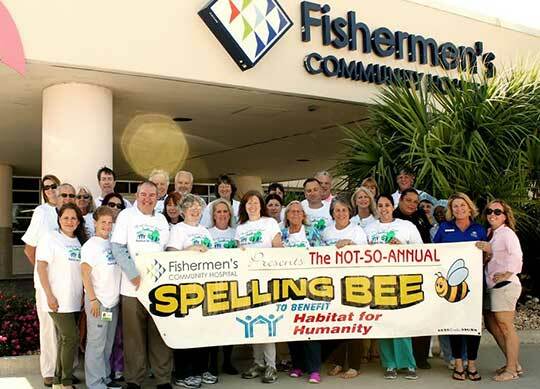 First State Bank has graciously sponsored the returning 2011 Spelling Bee Champions as they compete to retain their title at this year's 13th (not-so) Annual Adult Spelling Bee to be held on Sept. 21st, 7pm at San Pablo Catholic Church Hall. Pictured: Habitat Middle Keys Executive Director, Christine Todd Young; Spelling Team, Mary Lou Darczuk, Rosa Rios, Deb Smith; First State Bank Marathon Branch Manager Becky Shifflett. "Habitat Day" at Fishermen's Community Hospital 9/5. 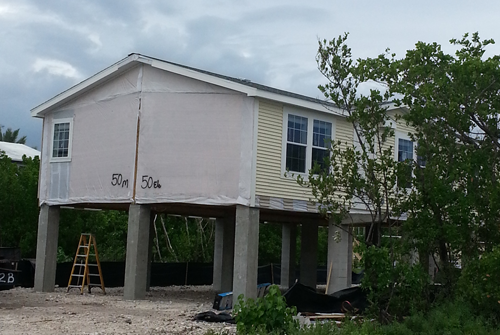 Thank you all for supporting Habitat for Humanity of the Middle Keys' mission. 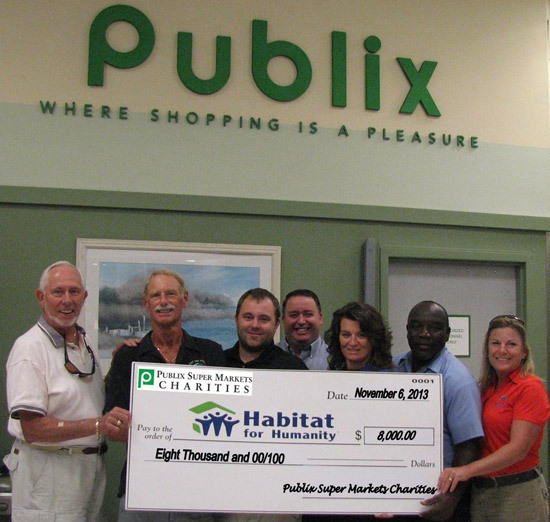 The Publix Super Markets Charities has made an outstanding contribution to Habitat for Humanity of the Middle Keys. On May 2nd, 2012 a grant in the amount of $8,000 was awarded to the affiliate as support for their mission of creating truly affordable homeownership to hard working, income qualified families in Marathon. The grant will be used to fund a portion of the expense involved in preparing two vacant lots for the building new homes, anticipated to be complete January 2013. The partner families that were selected by Habitat Middle Keys are currently working on their required 500 hours of sweat equity. "We are very thankful and appreciative of the support," said Christine Todd Young, Habitat for Humanity of the Middle Keys' Executive Director. "Their generosity helps make our mission possible and dreams come true for families in Marathon". Habitat volunteers, directors and officers recognized longtime volunteer Bruce Ferraro by presenting him with their 1st "Lifetime Achievement Award". Ferraro has been a volunteer with Habitat for Humanity here and in other cities for over 20 years. "Bruce's involvement, leadership and achievements with our local affiliate has taken us to a greater level", states 2012 President, Jeff Smith. Ferraro's dedication and guidance made it possible for 16 hardworking families in Marathon to realize the dream of homeownership. Habitat for Humanity of the Middle Keys' mission is to create truly affordable homeownership to qualified, hardworking families. The 2012 Volunteer Board of Directors and Officers are: Jeff Smith, President; Tim Wonderlin, Vice President; Lili Huergo, Treasurer; Pam Marco, Secretary and Directors: Bob Warn, Katia Chacon, Delia Mercado, and Maria Triana. These individuals, along with multiple committee volunteers, work diligently on fundraising efforts to fund the homes they build. One example of their fundraising efforts is the upcoming Annual Mother's Day Dolphin Tournament presented by The California Wine Club. This event, started by Bruce Ferraro 6 years ago, will be integral in Habitat's efforts this year to build two more homes. "The community of Marathon is so generous and makes events like this possible," states Exec Director, Christine Todd Young who extends a Thank You to Salty's Waterfront Grill & the 7 Mile Marine, Dot Palm Landscaping, Holiday Inn Express Marathon, The Weekly Newspapers, Island Breeze Realty, Castaway's Restaurant and Sushi Bar, Conch Country, First State Bank, the Marathon Chamber of Commerce, the UPS Store, and Centennial Bank. This one day, fun and festive fishing tournament is scheduled for May 11-12th. For more information about the tournament please visit www.mothersdaydolphintournament.com and if you would like to become more involved with Habitat please visit www.habitatmiddlekeys.org or call 305-743-9828 to see how you can help. On behalf of Habitat for Humanity of the Middle Keys' Board of Directors, volunteers, current homeowners and future homeowners we would like to extend a heartfelt thank you to the City of Marathon Council for the generous grant awarded on Dec. 13th to our affiliate in the amount of $3,600. Habitat for Humanity of the Middle Keys is a non-profit Christian housing ministry founded on the conviction that every man, woman and child deserves a safe, decent and affordable home. Since 1991, Habitat's dedication to this mission has made it possible for 19 deserving families with low-to-moderate income realize the dream of homeownership. At the end of 2011, we selected two additional families as new potential homeowners. The funds awarded by the City Council will help aid us in preparing one of the two homes scheduled for 2012. One of the recently selected families will get to purchase this home and call it their own. It is so rewarding and emotional to watch a young child get excited to "pick" his or her own room for the first time in their life. This is something most take for granted and something many children do not have. We have changed the lives of 19 families here in Marathon and we cannot thank the City Council enough for supporting our mission as we change to lives of two more. Habitat for Humanity of the Middle Keys, Inc.
Monroe County Sheriff's Deputy Willie Guerra had all but put in his notice and prepared to move his family to Cape Coral. He and his wife, Juneisy, a nurse with Hospice and the Visiting Nurses Association, just welcomed a third son, and their modest trailer with one and a half bedrooms was anything but suitable living conditions for their family. "It's hard, because as a as a cop and a nurse, we feel like we should be able to afford something down here," Guerra noted. 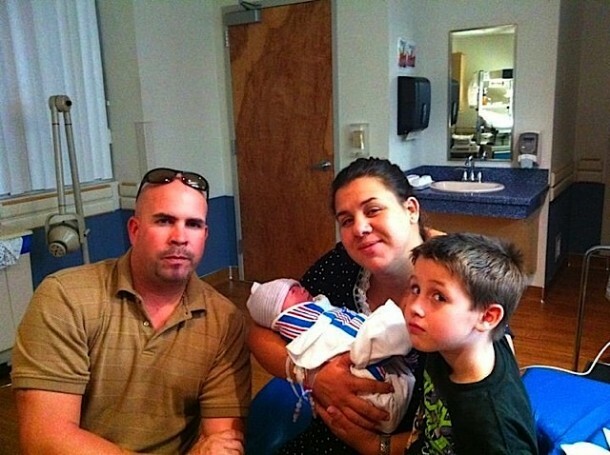 Andrew Guerra was born on Tuesday, Nov. 8 at 5 pm to parents Wilfredo and Juneisy Guerra. Born in Key West at Lower Keys Medical Center, Andy weighed an even 8 lbs. and measured 20 inches long. His proud brother, Anthony, 6, has been keeping a close eye on his baby brother with help from brother William, 17. After making half a dozen offers on modest homes only to be shut out by buyers with cash in hand, Guerra admitted he'd reached the end of his rope. Though he could easily work in law enforcement on the mainland for significantly greater pay, the Guerras have made their home in Marathon for the past 11 years; he'd much prefer to raise his family, including newborn, Andy, in a close-knit community where the crimes rates are significantly lower. That was precisely the reason why he and Juneisy applied for a home through Habitat for Humanity of the Middle Keys, and late last month, they received word that they'd be able to remain in the town they've come to know as home. "A lot of people don't want to put in for it," Guerra elaborated, "but it's to help keep people like us from moving away because we can't afford to live here." Executive Director Christine Todd Young emphasized that becoming a Habitat family is a privilege that's earned and not simply a gift of a free and clear home. "Once a family is chosen, they are then prospective homeowners because they must complete 100 sweat equity hours and are responsible for the mortgage," Young said. "They pay taxes and insurance just like every other homeowner. However, it's a 0% interest mortgage, which makes it truly affordable housing by keeping the payments low." For Tim Wonderlin, who's been involved with Habitat for Humanity for the past four years and currently chairs the Family Selection Committee said this year is a particularly special one in that two families will receive the keys to their new home in the coming months. "We're happy to be able to put another family that's been living in conditions that are not comfortable for their situation in their own home," Wonderlin said, "Any family we can help is good, but to be able to help two families in one year is great." Shelley Hornbuckle, along with her daughter Kali and Kali's grandfather, Ron Hornbuckle, will be the proud recipients of the next Habitech Home built in partnership with students at Marathon High School. Shelley Hornbuckle, (third from left) with her daughter, Kali, is the second family in Marathon to be selected as a prospective new homeowner by Habitat for Humanity of the Middle Keys. She is pictured with (l-r): Bruce Ferraro, President; Pam Marco, Secretary; Katia Chacon, Director; Delia Martinez, Director; Angel Cabrera, Family Selection Committee; Maria Triana, Director; Linda Lee, Family Selection Committee; Bob Byars, Volunteer; and Kelly Manghir, Director. Upon completing sweat equity requirements, Hornbuckle, her daughter and father will become the newest Habitat for Humanity homeowners. Hornbuckle, like the first Habitech Home owner, Sarah Adams, is a graduate of MHS; it was actually through Adams that Hornbuckle learned about the Habitat application process. "Mrs. Adams was Kali's third grade teacher, and she passed out fliers to her students," Hornbuckle remembered. "My dad went with me to the affordable homeownership workshop, and as soon as I brought the paperwork home and began filling it out, I just started calling it my home ... tried to remain positive." The medical surgical nurse at Lower Keys Medical Center works four 12-hour shifts per week in between which she also works for the Area Health Education Coalition (AHEC) assisting with school readiness screenings. Her father, a retired veteran who currently resides in Miami, regularly takes the five-hour bus ride down from Miami to care for Kali when mom's working overnight. Hornbuckle and her daughter currently reside in the Middle Keys housing project, and she counts their selection as prospective new homeowners through Habitat among a growing list of blessings. "If I'd not been able to find a place in the projects, I wouldn't still be here in Marathon because I couldn't afford it," Hornbuckle admitted. Even after a long night at work, she's still eager to help organize closets at the Elks Lodge and pass out fliers to residents and visitors throughout the Lower Keys and Key West to promote the upcoming D'Asign Source Gala on Dec. 3 – Middle Keys Habitat's primary annual fundraiser – because each sweat equity hour she logs help get her one step closer to owning her own home. For recent Habitat Scoop articles, click here.